The Dallas region is playing a fast game of catch-up. A generational sea change back to the city is in full tide. With unprecedented population growth anticipated, the sprawl of our past is no guide to our future. This special edition examines the successes and pitfalls of the urbanist movement in a region well known for its dependence on the automobile. 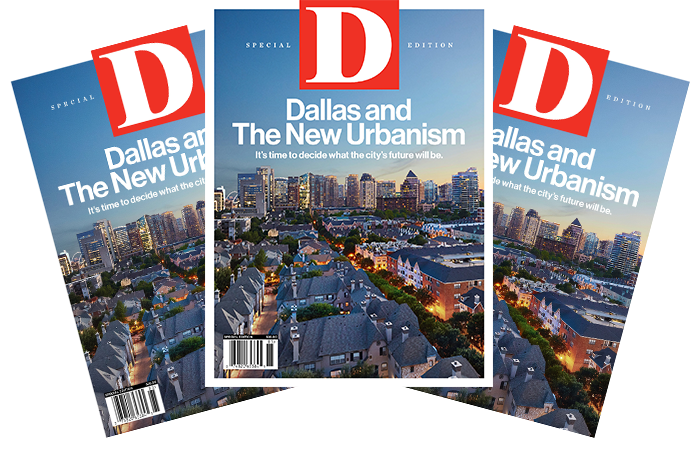 With this region’s population forecasted to increase by 4.5 million in the next 20 years, this issue focuses on how Dallas will adapt to this change, where opportunities lie, and how cities can encourage best practices, with specific examples and case studies.